As pulmonologists, our physicians possess specialized knowledge and skill in the diagnosis and treatment of pulmonary (lung) conditions and diseases. Pulmonology is classified as an internal medicine subspecialty. Because pulmonologists encounter a variety of clinical problems, they must have knowledge of internal medicine and other specialties in order to obtain certification. Some conditions that a pulmonologist will diagnose and treat include asthma, chronic cough, COPD (chronic obstructive pulmonary disease), lung cancer, and sarcoidosis. Pulmonologists may serve as consultants to other physicians as well as provide long-term care to patients with chronic conditions. 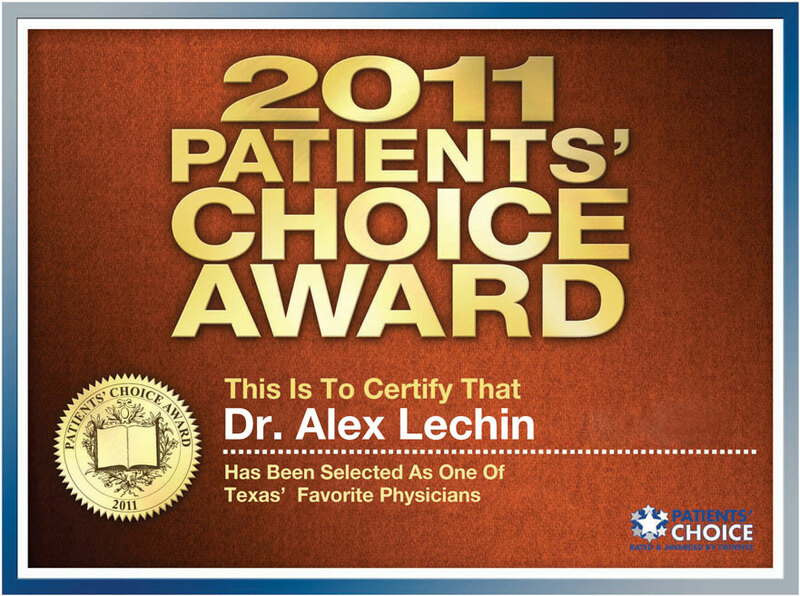 Alex E. Lechin, M.D., F.C.C.P., F.A.A.S.M. Dr. Lechin is certified by the American Board of Internal Medicine (ABIM). 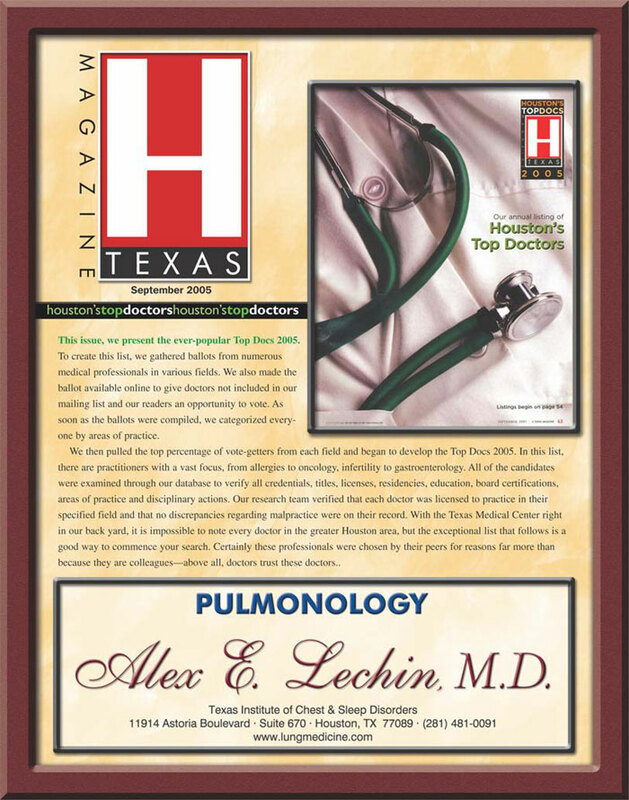 H TEXAS Magazine: Nominated as one of Houston's Best Pulmonologists. 1. 1995-1996 Ambien – Sanofi-Aventis. 2. 1998-2000 Lovenox – Sanofi Aventis. 3. 2000-2002 Avelox – Bayer Pharmaceutical Corp.
4. 2000-2002 InterMune – InterMune, Inc.
5. 2004 Spiriva - Boehringer Ingelheim Pharmaceuticals. 6. 2005-2007 Requip - Glaxo/Smith/Kline Group of Companies. 7. 2006 Chantix – Pfizer. 8. 2006 Foradil – Schering Corporation. 9. 2006 – 2007 Mirapex – Boehringer Ingelheim Pharmaceuticals. 10. 2007 Symbicort – AstraZeneca Companies. 11. 2008 Alvesco – Sepracor, Inc.
2011 Protocol HZC113782: A Clinical Outcomes Study to compare the effect of Fluticasone Furoate/Vilanterol Inhalation Powder 100/25mcg with placebo on Survival in Subjects with moderate Chronic Obstructive Pulmonary Disease (COPD) and a history of or at increased risk for cardiovascular disease. 69. "Prediction of nCPAP delivered pressure at altitude ( abstract)." Lechin AE, Fromm R,Varon J, Hirshkowitz M. Chest 1994; 106(Suppl):44S. 68. "Outcome of patients admitted to a low selective chronic ventilator dependency unit.” Krum W, Lechin AE, Varon J, Reinoso MA. (Abstract) Chest 1994;106(suppl): 142S. 67. "Fiberoptic bronchoscopy diagnostic yield of various procedures in a training program” Lechin AE, Varon J, Fromm R, Lam M, Reinoso MA (Abstract). Chest 1994; 106 (Suppl): 54S. 65. "The Houston CPAP follow up questionnaire." Hirshkowitz M, Lechin AE. 1994 World Congress on Sleep Apnea. 64. "Circulating Catecholamines and Indolamines throughout Normal Wake-Sleep Cycle.” Lechin F, Pardey-Maldonado B, van der Dijs B, Benaim M, Baez S, Orozco B, Lechin AE. Psychoneuroendocrinology (In Press). 62. "Serotonin Bronchial Hyper-responsiveness and Eosinophilic-Associated Gastrointestinal Disease." Lechin, F; van der Dijs, B; Lechin, AE. Gastroenterology (Accepted for Publication). 60. "Serotonin Bronchial Hyper-responsiveness and Eosinophilic Cholangiopathy." Lechin, F; van der Dijs, B; Lechin, AE. Dig. Dis. Sci. 2007; 52(12): 3369 – 3370. 59. "Circulating Serotonin, Catecholamines and CNS Circuitry Related to Some Cardiorespiratory and Vascular Disorders." Lechin, F; van der Dijs, B; Lechin, AE. J Appl Res 2005; 5(4):605 – 621. 58. "Tianeptine: A New Exploratory Therapy for Asthma." Lechin F, van der Dijs B, Lechin AE. Chest 125: 348 – 349, 2004. 57. "Natural Killer Cell Activity and Neuroimmunological Treatment of Cancer." Lechin, F; van der Dijs, B; Lechin, AE. Clin Cancer Res 2004: 10:8120 – 8121. 56. "The Autonomic Nervous System Assessment Throughout the Wake-Sleep Cycle and Stress." Lechin, F; van der Dijs, B; Lechin, AE. Psychosomatic Medicine 2004; 66:974 – 976. 55. "Treatment of Bronchial Asthma With Tianeptine." Lechin, F’ van der Dijs, B; Lechin, AE. Methods Find Exp Clin Pharmacology 2004, 26 (9): 697-701. 54. "Neural Sympathetic Activity in Essential Hypertension." Lechin, F; van der Dijs, B; Lechin, AE. Hypertension 2004, 44: e3 – e4, doi: 10.1161/01. HYP.0000133817.30057.2b. 53. "Tianeptine: A New Exploratory Therapy for Asthma." Lechin, F; van der Dijs, B; Lechin, AE. Chest 125: 348 – 349, 2004. 52. "Circulating Neurotransmitter Profiles During the Different Wake-Sleep Stages in Normal Subjects." Lechin, F; van der Dijs, B; Pardey-Maldonado, B; Benaim, M; Baez, S; Orozco, B; Lechin, AE. Psychoneuroendocrinology 29: 669 – 685, 2004. 51. "Tianeptine, Plasma Serotonin and Pulmonary Hypertension." Lechin, F; van der Dijs, B; Lechin, AE. The Lancet 361(9351):87, 2003. 50. "Pulmonary Hypertension, Left Ventricular Dysfunction and Plasma Serotonin: Commentary on Deuchar, et al." Lechin, F; van der Dijs, B; Lechin, AE. British Journal of Pharmacology 137: 937 -- 938, 2002. 49. "Plasma Serotonin, Pulmonary Hypertension and Bronchial Asthma." Lechin, F; van der Dijs, B; Lechin, AE. Clinical Science 103: 345 – 346, 2002. 48. "Severe Asthma and Plasma Serotonin." Lechin, F; van der Dijs, B; Lechin, AE. Allergy 57:258 – 259, 2002. 47. "Candida Lusitaniae and Catheter Related Sepsis in a Non-Neutropenic Adult Woman: Case Report and Review of the Literature." Pietrucha-Dilanchan, P; Lewis, RE; Hussain, A; Lechin, AE. Annals of Pharmacotherapy 35(12): 1570 – 4, 2001. 46. "The Serotonin Uptake-Enhancing Drug Tianeptine Suppresses Asthmatic Symptoms in Children. A Double-Blind Crossover Placebo-Controlled Study." Lechin, F; van der Dijs, B; Lechin, AE; Orozco, B; Lechin, ME. J Clin Pharmacol 38:918 – 925, 1998. 45. "Effects of Buspirone on Plasma Neurotransmitters in Healthy Subjects." Lechin, F; van der Dijs, B; Jara, H; Orozco, B; Baez, S; Benaim, M; Lechin, M; Lechin, AE. J Neural Transm 105(6/7):561—573, 1998. 44. "Neuropharmacological Treatment of Bronchial Asthma with an Antidepressant Drug – Tianeptine: A Double Blind Crossover Placebo-Controlled Study." Lechin, F; van der Dijs, B; Orozco, B, Jara, H; Rada, I; Lechin, ME; Lechin, AE. Clin Pharmacol Ther 64:223 – 232, 1998. 43. "Successful Neuropharmacological Treatment of Myasthenia Gravis: Report of Eight Cases.” Lechin, F; van der Dijs, B; Jara, H; Baez, S; Orozco, B; Jahn, E; Lechin, ME; Jimenez, V; Lechin, AE. Res. Comm. Biol. Psychol. Psychiatry 22:81 – 94, 1997. 42. "Plasma Neurotransmitter Profiles of Anxiety, Phobia and Panic Disorder Patients: Acute and Chronic Effects of Buspirone.” Lechin, F; van der Dijs, B; Jara, H; Orozco, B; Jahn, E; Benaim, M; Lechin, AE; Lechin, ME; Jimenez, V. Res Comm Biol Psychol Psychiatry 22:95 –110, 1997. 41. "Plasma Neurotransmitters, Blood Pressure and Heat Rate During Supine- Resting, Orthostasis and Moderate Exercise Stress Test in Healthy Humans Before and After Parasympathetic Blockade with Atropine.” Lechin, F; van der Dijs, B; Orozco, B; Baez, S; Rada, I; Leon, G; Garcia, Z; Jara, H; Lechin, AE; Lechin, ME. Res Comm Biol Psychol Psychiatry 21:55 – 72, 1996. 40. "Plasma Neurotransmitters, Blood Pressure and Heart Rate During Supine- Resting, Orthostasis and Moderate Exercise in Severely Ill Patients: A Model of Failing to Cope with Stress.” Lechin, F; van der Dijs, B; Orozco, B; Lechin, AE; Baez, S; Lechin, ME; Benaim, M; Rada, I; Acosta, E; Arocha, L; Jimenez, V; Leon, G; Garcia, Z. Psychother Psychosom 65:129-136, 1996. 39. "Increased Levels of Free-Serotonin in Plasma of Symptomatic Asthmatic Patients." Lechin, F; van der Dijs, B; Orozco, B; Lechin, ME; Lechin, AE. Ann Allergy Asthma & Immunol 77:245 – 253, 1996. 38. "Complications From Flexible Fiberoptic Bronchoscopy in a Training Program.” Reinoso, MA; Lechin, AE; Varon, J; Wade, L. J Bronchology, 1996; 3:177 – 181. 37. "Impending Death and Sertraline.” Varon, J; Lechin, AE; Taylor, TV. J Emerg Med, 1995; 13(2):246. 36. "CPAP Machine Performance and Altitude." Fromm, R; Varon, J; Lechin, AE; Hirshkowitz, M. Chest, 1995; 108: 1577 – 1580. 35. "Plasma Neurotransmitters, Blood Pressure and Heart Rate During Supine- Resting, Orthostasis and Moderate Exercise Conditions in Major Depressed Patients." Lechin, F; van der Dijs, B; Orozco, B; Lechin, ME; Acosta, E; Lechin, AE; Baez, S; Rada, I; Arocha, L; Leon, G; Garcia, Z. Biol Psychiat 38:166 – 173, 1995. 34. "Plasma Neurotransmitters, Blood Pressure and Heart Rate During Supine- Resting, Orthostasis and Moderate Exercise in Dysthymic Depressed Patients.” Lechin, F; van der Dijs, B; Orozco, B; Lechin, AE; Baez, S; Lechin, ME; Rada, I; Acosta, E; Arocha, L; Jimenez, V; Leon, G; Garcia, Z. Biol Psychiatry 37:88 - - 91, 1995. 33. "Two Types of Irritable Bowel Syndrome: Differences in Behavior, Clinical Signs, Distal Colon Motility and Hormonal, Neurochemical, Metabolic, Physiological and Pharmacological Profiles." Lechin, F; van der Dijs, B; Lechin-Baez, S; Lechin, AE; Orozco, B; Lechin, ME; Rada, I; Jara, H; Gomez, F; Cabrera, A; Jimenez, V; Arocha, L; Leon, G. Arch Ven Farmac Terap 12:105 – 114, 1994. 1994. 31. "Plasma Neurotransmitters, Blood Pressure and Heart Rate During Rest and Exercise,” Lechin, AE; Varon, J; van der Dijs, B; Lechin, F. (Abstract). Am J Respir Critical Care Medicine 149:A482, 1994. 30. "Plasma Neurotransmitters and Cortisol in Chronic Illness: Role of Stress.” Lechin, F; van der Dijs, B; Lechin, AE; Orozco, B; Lechin, ME; Baez, S; Rada, I; Leon, G; Acosta, E. Jour of Med 25:181 – 192, 1994. 29. "Peripheral Blood Immunological Parameters in Long Term Benzodiazepine Users.” Lechin, F; van der Dijs, B; Vitelli-Flores, G; Baez, S; Lechin, ME; Lechin, AE; Orozco, B; Rada, I; Leon, G, Jimenez, V. Clinical Neuropharmacology 17:63 – 72, 1994. 28. "Air Medical Transport (Transporte Aeromedico). Varon, J, Fromm, RE; Lechin, AE. Interam 1994; 2:83 – 86. 27. "Adult Respiratory Distress Syndrome (ARDS): The Basics.” Lechin, AE; Varon, J. J Emerg Med, 1994, 2:63 – 68. 26. Pulmonary Complications of HIV Infection: Part I.” Lechin, AE; Varon, J: Hosp Physician, 1993: 29(6): 16 -- 21. 25. "Pulmonary Complications of HIV Infection: Part II.” Lechin, AE; Varon, J. Hosp Physician, 1993; 29(7): 38 – 40. 24 "Plasma Neurotransmitters Throughout an Oral Glucose Tolerance Test in Essential Hypertension.” Lechin, F; van der Dijs, B; Lechin, M; Jara, H; Lechin, AE; Lechin-Baez, S; Orozco, B; Rada, I; Cabrera, A; Arocha, L; Jimenez, V; Leon, G. Clin Exp Hypertension 15: 209 – 240, 1993. 23. "Effects of an Oral Glucose Load on Plasma Neuotransmitters in Humans; Involvement of REM Sleep.” Lechin, F; van der Dijs, B; Lechin, M; Lechin- Baez, S; Jara, H; Lechin, AE; Orozco, B; Rada, I; Cabrera, A; Jimenez, V. Neuropsychobiology 26:4 – 11, 1992. 22. "Clonidine Treatment of Acute Pancreatitis: Report of Five Cases.” Lechin, F; van der Dijs, B; Lechin, M; Jara, H; Lechin, AE; Carera, A; Rada, I;; Orozco, B; Jimenez, V; Valderrama, T. Acta Gastroent Latinoamer 22:119 – 124 , 1992. 21. "Dramatic Improvement With Clonidine of Acute Pancreatitis Showing Raised Catecholamines and Cortisol Plasma Levels: Case Report of Five Patients.” Lechin, F; van der Dijs, B; Lechin, M; Jara, H; Lechin, AE; Cabrera, A; Rada, I; Orozco, B; Jimenez, V; Valderrama, T. J Med 23: 339 – 351, 1992. 20. "Doxepin Therapy for Postprandial Symptomatic Hypoglycemic Patients: Neurochemical, Hormonal and Metabolic Disturbances." Lechin, F; van der Dijs, B; Lechin, AE; Lechin, M; Coll-Garcia, E; Jara, H; Cabrera, A; Jimenez, V; Gomez, F; Tovar, D; Rada, I; Arocha, A. Clin Sci 80: 373 – 384, 1991. 19. "Hypomagnesemia May Reduce Airflow Limitation.” Hauringa, AJ; Lechin, AE. Amer Rev Respir Dis, 1991; Vol. 143(4) PP:409. 18. "Psychoneuroendocrinological and Immunological Parameters in Cancer Patients: Involvement of Stress and Depression.” Lechin, F; van der Dijs, B; Vitelli, G; Lechin-Baez, S; Azocar, J; Cabrera, A; Lechin, AE; Jara, H; Lechin, M; Gomez, F; Arocha, L. Psychoneuroendocrinology 15: 435 – 451, 1990. 17. "Plasma Neurotransmitters and Cortisol in Duodenal Ulcer Patients: Role of Stress.” Lechin, F; van der Dijs, B; Rada, I; Jara, H; Lechin, AE; Cabrera, A; Lechin, M; Jimenez, V; Gomez, F; Villa, S; Acosta, A; Arocha, L. Dig Dis Sci 35: (11)1313 – 1319, 1990. 16. "Recurrent Gastroesophageal Symptoms and Precordial Pain in a Gastrectomized Man Improved by Amitriptyline: Physiologic, Metabolic, Endocrine, Neurochemical and Psychiatric Findings.” Lechin, F; van der Dijs, B; Rada, I; Lechin, M; Cabrera, A; Lechin, AE; Gomez, F; Jimenez, V; Arocha, L; Valderrama, T. J Med 20: 407 – 424, 1989. 15. "Pimozide Therapy for Trigeminal Neuralgia.” Lechin, F; van der Dijs, B; Lechin, ME; Amat, J; Lechin, AE; Cabrera, A; Gomez, F; Acosta, E; Arocha, L, Villa, S; Jimenez, V. Arch Neurol 46: 960 – 963, 1989. 14. "Definite and Sustained Improvement With Pimozide of Two Patients With Severe Trigeminal Neuralgia: Some Neurochemical, Neuro-physiological and Neuroendocrinological Findings.” Lechin, F; van der Dijs, B; Amat, J; Lechin, AE; Cabrera, A; Lechin, ME; Gomez, F; Arocha, L; Jimenez, V. J Med 19: 243, 1988. 13. "Plasma Neurotransmitters Profile in Reactive Hypoglycemia.” Lechin, AE; Jara, H; Cabrera, A; Villa, S; Jimenez, V; Guerrero, H. van der Dijs, B; Lechin, F. III Interamerican Congress of Clinical Pharmacology and Therapeutics and XII Latin-American Congress of Pharmacology. Arch Ven Farm Clin Terap 7, Sup. 1, Abst. 111, 1988. 12. "Definite and Sustained Improvement With Pimozide of Two Patients With Severe Trigeminal Neuralgia.” Lechin, F; van der Dijs, B; Amat, J; Lechin, AE; Cabrera, A; Lechin, ME; Gomez, F; Arocha, L; Jimenez, V. III Interamerican Congress of Clinical Pharmacology and Therapeutics and XII Latin-American Congress of Pharmacology. Arch Ven Farm Clin Terap 7, Sup. 1, Abst. 108, 1988. 11. "Definite and Sustained With Psychoactive Drugs: Three Crohn’s Disease Patients.” Lechin, F; van der Dijs, B; Azocar, J; Lechin, AE; Gomez, F; Amat, J; Lechin, ME; Villa, S; Baez, S; Acosta, E; Cabrera, A; Vitelli, G; Arocha, L; Fernandez, M; Mago, E. III Interamerican Congress of Clinical Pharmacology and Therapeutics and XII Latin-American Congress of Pharmacology. Arch Ven Farm Clin Terap 7, Sup. 1, Abst. 89, 1988. 10. "Plasma Neurotransmitters Profile in Irritable Bowel Syndrome (IBS) Diarrheic Patients.” Lechin, AE; Jara, H; Rada, I; Villa, S; Cabrera, A; Jimenez, V; van der Dijs, B; Lechin, F. III Interamerican Congress of Clinical Pharmacology and Therapeutics and XII Latin-American Congress of Pharmacology. Arch Ven Farm Clin Terap 7, Sup. 1, Abst. 88, 1988. 9. Plasma Neurotransmitters Profile in Duodenal Ulcer Patients.” Jara, H; Lechin, AE; Rada, I, Villa, S; Cabrera, A; Guerrero, H; van der Dijs, B; Lechin, F. III Interamerican Congress of Clinical Pharmacology and Therapeutics and XII Latin-American Congress of Pharmacology. Arch Ven Farm Clin Terap 7 Sup. 1, Abst. 86, 1988. 8. "Plasma Neurotransmitters Profile in Bronchial Asthma.” Lechin, AE; Villa, S; Jara, H; Cabrera, A; Jimenez, V, van der Dijs, B; Lechin, F. III Interamerican Congress of Clinical Pharmacology and Therapeutics and the XII Latin- American Congress of Pharmacology. Arch Van Farm Clin Terap 7, Sup. 1, Abst. 10, 1988. 7. "Adjunctive L-Tryptophane in the Treatments of Gilles de la Tourette Disease: Model of a Proposed Neurochemical Profile.” Lechin, F; van der Dijs, B; Gomez, F; Lechin, ME; Amat, J; Lechin, AE; Cabrera, A; Rodriguez, O. III International Congress of Clinical Pharmacology and Therapeutics and the XII Latin-American Congress of Pharmacology. Arch Ven Farm Clin Terap 7, Sup. 1, Abst 8, 1988. 6. "Plasma Neurotransmitters Profile in Depressive Syndromes.” Lechin, F; van der Dijs, B; Gomez, F; Villa, S; Cabrera, A; Jimenez, V; Guerrero, H; Lechin, AE. III Interamerican Congress of Clinical Pharmacology and Therapeutics and the XII Latin-American Congress of Pharmacology. Arch Ven Farm Clin Terap 7, Sup. 1 Abst. 7, 1988. 5. "Plasma Neurotransmitters in Anxiety Patients.” Gomez, F, Lechin, AE; Jara, H; Jimenez, V; Cabrera, A; Guerrero, H; van der Dijs, B; Lechin, F. III Interamerican Congress of Clinical Pharmacology and Therapeutics and the XII Latin-American Congress of Pharmacology Arch Van Farm Clin Terap 7, Sup. 1 Abst. 4, 1988. 4. "Plasma Neurotransmitters Profile in Cluster Headaches.” Van der Dijs, B; Lechin, AE; Villa, S; Gomez, F; Cabrera, A; Jimenez, V; Guerrero, H; Lechin, F. III Interamerican Congress of Clinical Pharmacology and Therapeutics and the XII Latin-American Congress of Pharmacology. Arch Ven Farm Clin Terap 7, Sup. 1, Abst. 3, 1988. 3. "Central Nervous System Circuitry Involved in Blood Pressure Regulation.” Lechin, F; van der Dijs, B; Amat, J; Lechin, AE. Arch Ven Farm Clin Terap 6: 79 – 101, 1987. 2. "Treatment of Ulcerative Colitis With Clonidine.” Lechin, F; van der Dijs, B; Insausti, CL; Gomez, F; Villa, S; Lechin, AE; Arocha, L; Oramas, O. J Clin Pharmacol 25: 219, 1985. 1. "Effects of Clonidine on Blood Pressure, Noradrenaline, Cortisol, Growth Hormone and Prolactin Plasma Levels in High and Low Intestinal Tone Depressed Patients.” Lechin, F; van der Dijs, B; Jakubowitz, D; Camero, RE; Villa, S; Arocha, L; Lechin, AE. Neuroendocrinology 41: 156, 1985. 3. "Hematological Disorders: In Practical Guide to the Care of the Critically Ill Patient." Lechin, AE; Varon, J; (Eds). St. Louis:Mosby-Year Book, Inc. 1994:170 – 192. 2. "Gastrointestinal Disorders: In Practical Guide to the Care of the Critically Ill Patient." Lechin, AE; Varon, J; (Eds.) St. Louis:Mosby-Year Book, Inc. 1994:149 – 160. 1. "Central Nervous System Circuitry Involved in Blood Pressure Regulation in Neurochemistry and Clinical Disorders: Circuitry of Some Psychiatric and Psychosomatic Syndromes." Lechin, F; van der Dijs, B; Lechin, AE. (Eds). Boca Raton, Florida: CRC Press, 1988.